Summertime is my favorite time of the year. 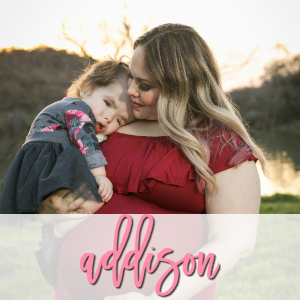 It’s a chance to get outside and go to the zoo with Addie, eat at an outdoor restaurant with Mathew, or even have a girls night in with some friends. 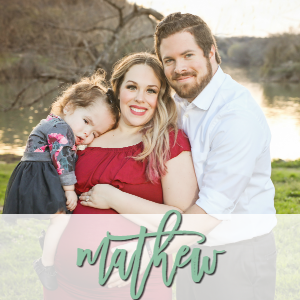 Not only that, but this Summer is particularly bringing around Father’s Day, Addie’s 1 year anniversary of being home from the hospital, my Young Living convention trip to Utah, my 30th birthday, Mathew’s 29th birthday, and Addie’s 2nd birthday. 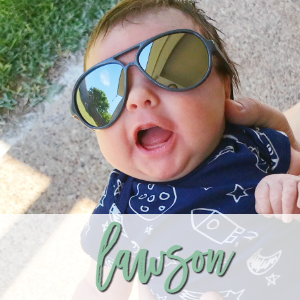 We have so many things to celebrate and enjoy this Summer! 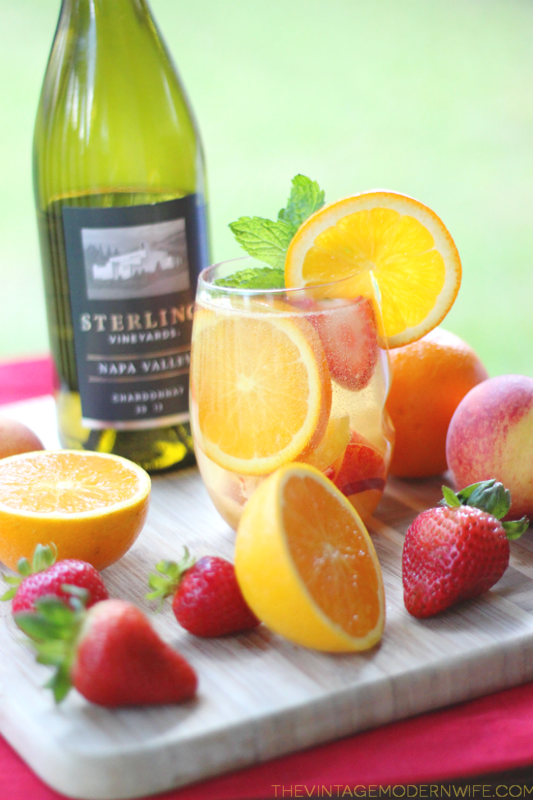 Summer is the perfect time to stock up on fresh fruit and what better way to use it up than with a Sparkling White Wine Summer Sangria with Sterling Vineyards Chardonnay? What I love about this Sparkling White Wine Summer Sangria is that it starts with Sterling Vineyards Napa Valley Chardonnay, and it’s mixed with peaches, strawberries, oranges, then topped off with a little LaCroix Coconut Sparkling Water and mint. It just takes 5 minutes to make, gets better when you leave it in the fridge to meld together, and is absolutely one of those “love at first sip” type of drinks. We love it because it’s perfect for summer parties, barbeques, or drinks with friends in the hot sun. It’s like a tropical drink from heaven- I hope you love it! 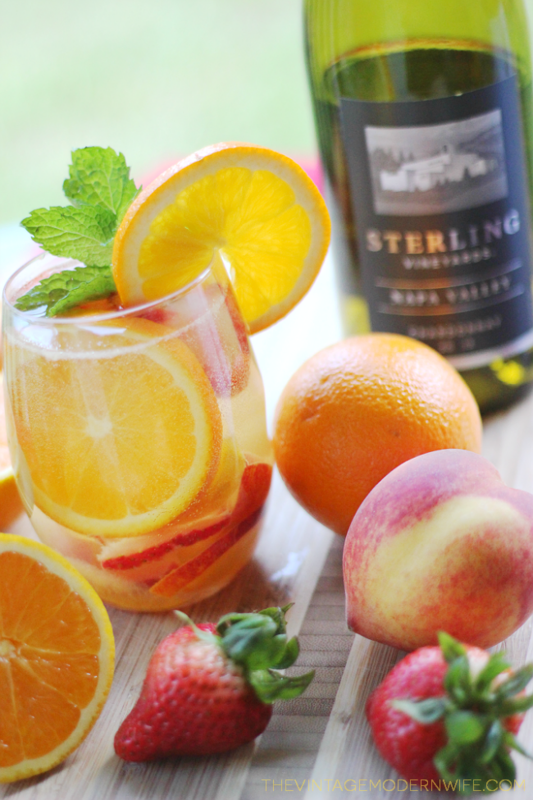 This Sparkling White Wine Summer Sangria combines Sterling Vineyards Napa Valley Chardonnay with all things summer! It's the absolute most perfect drink and will surely be love at first sip! 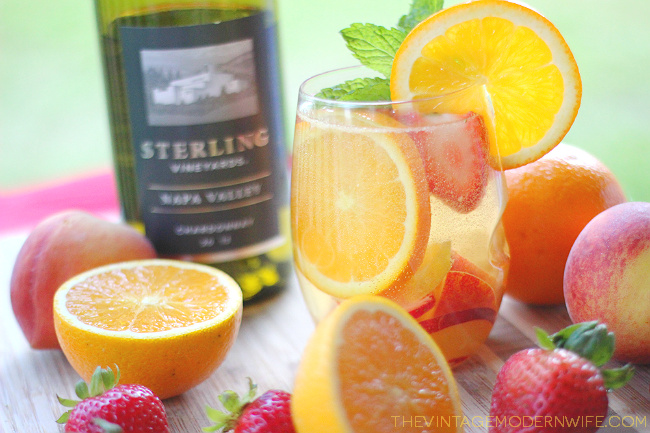 In a clear pitcher, combine Sterling Vineyards Napa Valley Chardonnay with fruit. Top with LaCroix Coconut Flavored Sparkling Water and stir. Refrigerate for at least 1 hour, allowing the fruit to combine with the wine. What are your favorite fruits to add to your Sparkling White Wine Summer Sangria? Well, hello delicious! This looks amazing! Yum! Sangria was one of my go-to drinks before I was pregnant. This one looks delicious! Ashley recently posted…S’mores Latte Recipe – Perfect for Camping! This looks so delicious and refreshing for summer! This looks absolutely delicious and sounds perfect for summer!